Team drivers Tim Keber and Logan Spence line up the Gear Gators robot for competition. A local area youth robotics team earlier this month earned a berth in the State Robotics Championships to be held Feb. 17 at the SAC Museum near Ashland. 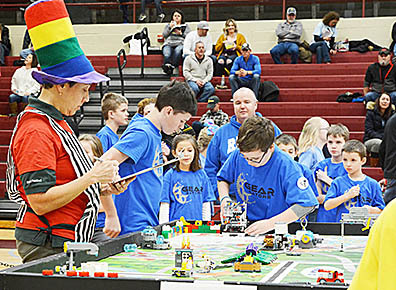 The Albion and Spalding area youths, who are members of the Gear Gators robotics team, earned a top 12 placing among 32 teams from across Nebraska in the First Lego League regional competition held Jan. 13 at Columbus Middle School. First Lego League is a mentor-based, experiential science, technology, engineering and math (STEM) program for kids ages 9-14. It’s an alliance between FIRST, an international organization to inspire young people, and the LEGO group. In Nebraska, it is organized by the state’s 4-H program, which is an extension of the University of Nebraska in Lincoln. The program is designed to foster 21st century life skills and spark kids’ interest in STEM, so they become innovative problem-solvers able to tackle the world’s biggest challenges. First Lego League (FLL) is divided into four areas: The robot game, robot design, core values and project. The “Gear Gators” team from Albion and Spalding placed fifth in the robot design, and they were among the top 12 teams earning a berth in the state championships to be held Feb. 17. Team members are Zeke Sandman, Joanna Spence, Eloise Martinez, Tim Keber, David Keber, Nick Keber, Logan Spence, Tim Woebbecke and Clay Sandman. Gear Gators are coached by Jean Keber and Jason Spence. Read more in the Jan. 31 Albion News Print and E-Editions.